I love tradition. There is a warm feeling that comes over me like hot towels just out of the dryer when I think of my own family traditions. Perhaps this is because many of these traditions that are centered around cozy things, like the holidays, baking and happy times spent with loved ones. 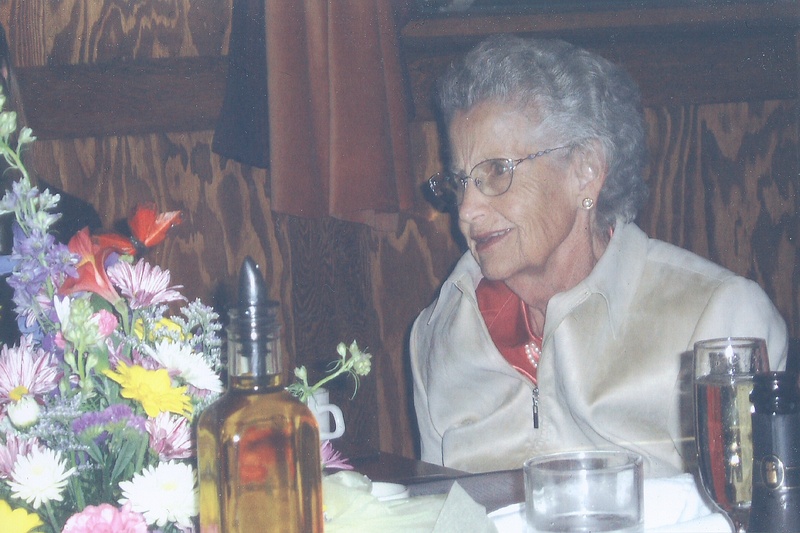 One of the biggest influences of tradition in my family was my grandma Grace. She passed over to watch over us nearly 7 years ago. If you are new to this blog, you will come to learn that I had a very special relationship with my grandparents, particularly my grandma growing up. While she was undoubtedly the family matriarch she had a soft spot for her grandchildren. Grace is my mother’s middle name and my middle name is my Mother’s name. When E was born, I struggled with the idea of breaking that tradition. To not give E my first name as her middle name would be to break a tradition that my beloved grandma started and my mother lovingly passed on to me. But I did break it with my own twist; I gave E Grace. Emma Grace. The tradition changed a bit, but it’s still in tact, much like my other favorite Grace tradition, baking. To bake like Grace is to be deliberate, precise and delicious. With great ease my own mother became an excellent baker and as time passed, I seem to have acquired this skill. The tradition of baking has deep roots in our family. Everything is from scratch and don’t even think about skimping on the quality of the ingredients. Whether or not it makes a difference in the outcome is irrelevant, don’t just don’t skimp. Like all good traditions you start with the foundation. In the case of my cookies it’s the ingredients. If you want to replicate this recipe you have to use name brand ingredients. Start with the recipe on the bottom side of the lid of Quaker Oats Old Fashioned Oatmeal. Note, you will not add the Cinnamon or raisins to this recipe. Prior to embarking upon combining ingredients, I like to get everything out and ready. This is obviously personal preference but it makes baking a lot easier when the ingredients are prepped. Additionally, for this recipe, I like to pre-mix the dry ingredients so that they are ready to add all at once. One thing to note per our family’s style of baking, which is different from cooking, is that for best results, we are very precise with our measurements. In our family we have always used a butter knife to level everything down to the last grain of sugar or speck of flour. Once your ingredients are prepped and ready and the oven is turned on, you are ready to go. 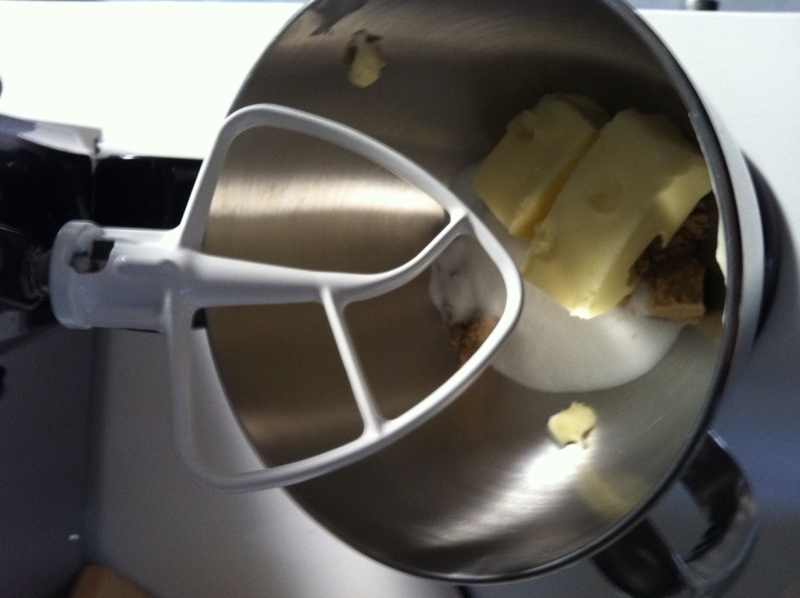 As you follow the recipe you will mix the sugars and butter together. If the butter is refrigerated I usually put it in a glass bowl and heat for 20 seconds to soften. 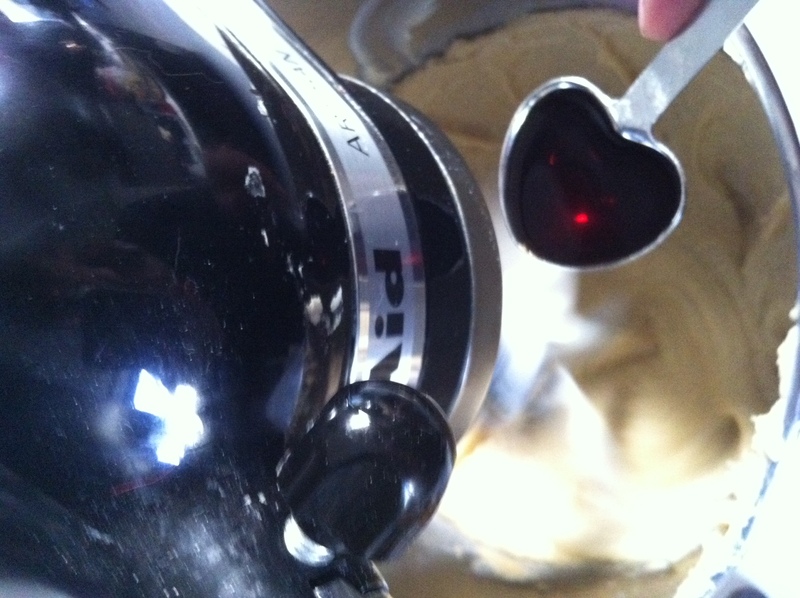 Put everything into the electric mixer and mix until smooth and creamy but do not whip. Butter and Sugar waiting to be mixed. Next up time to do the super double top secret family tradition which is to add the eggs and an EXTRA teaspoon of vanilla. So instead of just adding 1 tsp, you will add 2 (you can thank me later). Adding an extra tsp of vanilla takes your cookies to the next level. After you mixture is mixed well but not whipped, be sure to get out your spatula and get the bits off the side as well, it’s time to add the pre-mixed together dry ingredients. 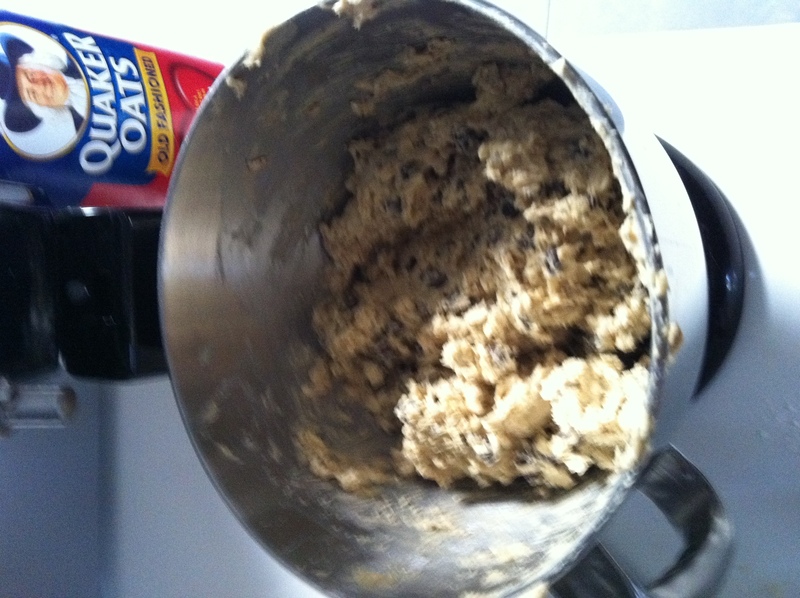 Next up you will add the oats and chocolate chips. 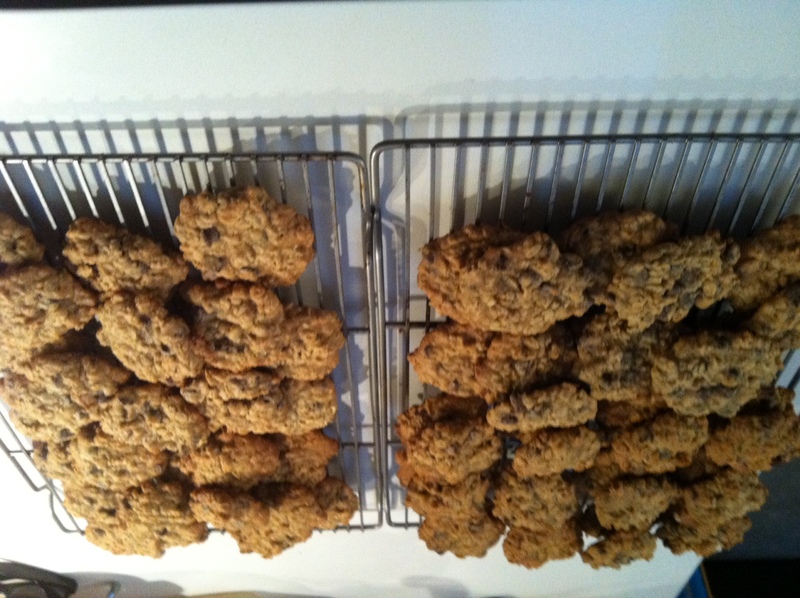 Be sure to mix in the oats and the chocolate chips by hand with a spoon or it messes with the texture of the cookies. You can also always add more chocolate chips. I usually use the whole bag as extra chocolate is just a bonus! 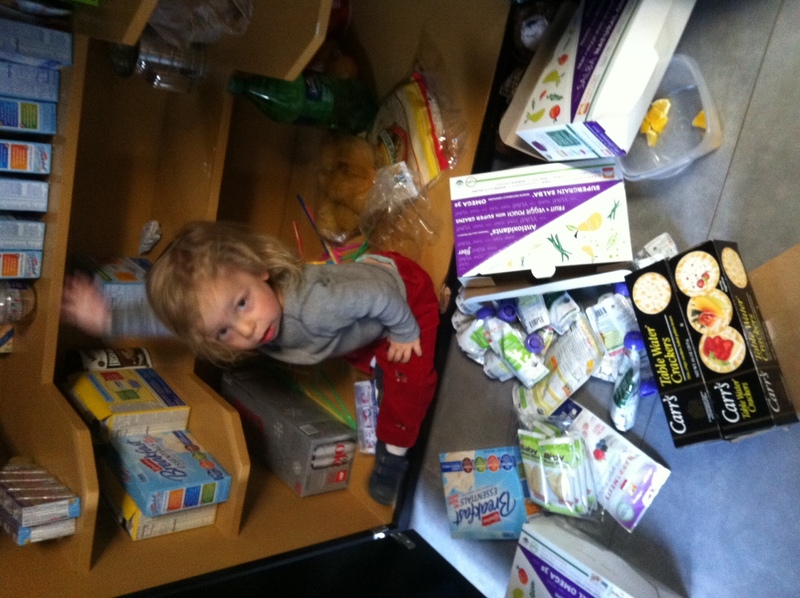 Intermission: As I prepared the dough, Q helped me by cleaning out the pantry. Very important to reorganize or perhaps disorganize...tamato/tomaaato. And then he helped me by dumping sugar all over the floor and then he went I sent him to play with Nana H.
I could hear the shhhhhh and the sugar poured out the box. Awesome. Now back to our baking. 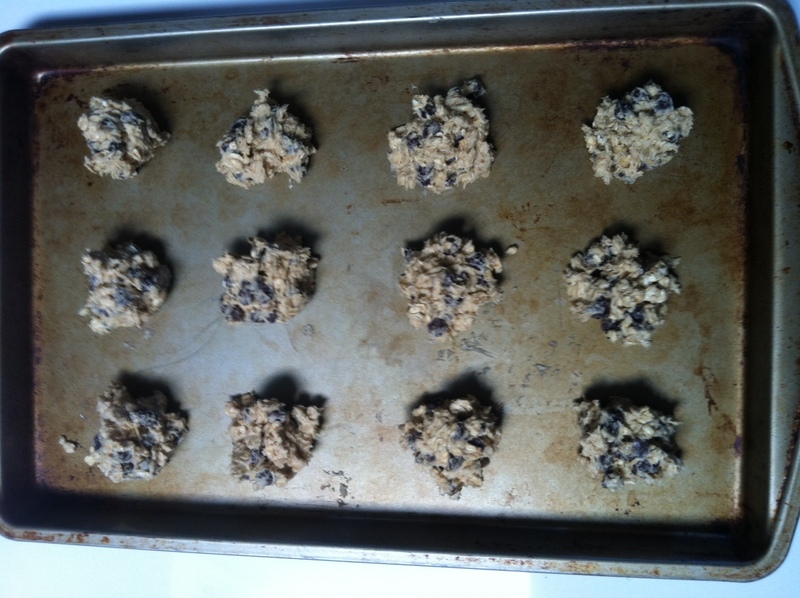 I usually put 12 spoonfuls of cookie dough on the cookie sheet and always bake the cookies on the top rack of my oven. Depending on your altitude, the time will vary. Here in LA I bake them for about 11 minutes until they are browning on the top. Cookies all spooned out on cookie sheet. 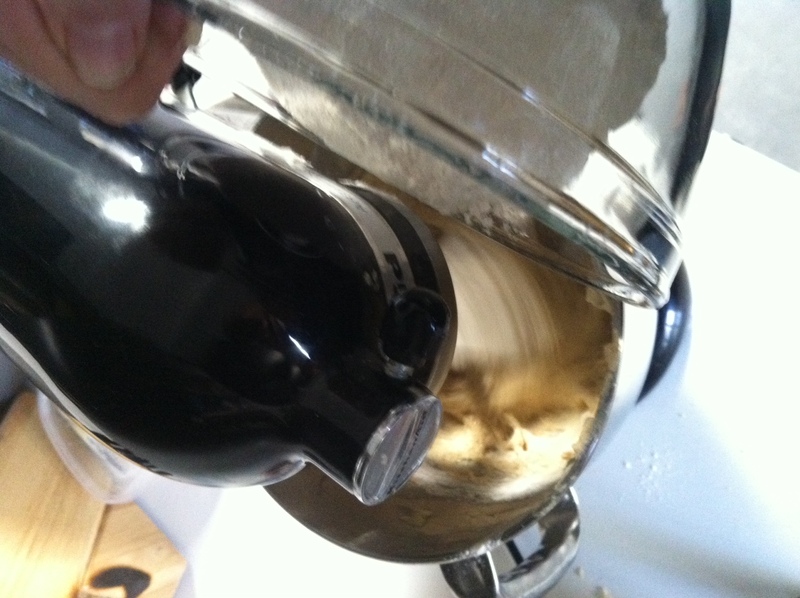 You should be able to get about 2.5 dozen per mixture. After you bake them and then it’s time for the fun part. Cool them on their baking racks. These particular cookies went into baskets for my visit with the March of Dimes to the NICU nurses at Cedars to say thank you for all of their hard work. Lest you think I have turned over a crafty leaf, my friend T again came to our rescue (remember Pebbles and Bam Bam at Halloween!) and helped me make them look very pretty in these baskets. This baking and giving will become an annual tradition for me as it’s good for my soul and it heals me to give in this way. 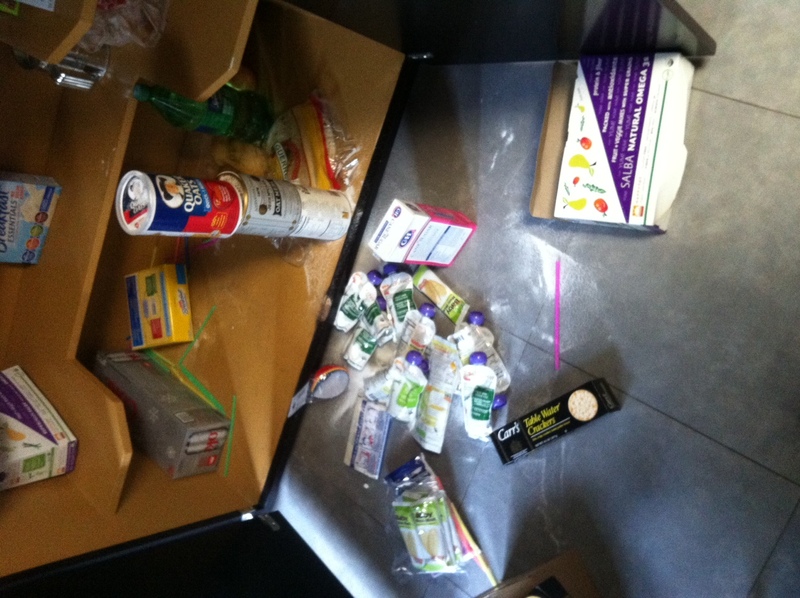 To see all the nurses who lovingly took care of our minis was cathartic in a way. To stand in those hallowed halls and not feel scared or anxious was its own gift to me. And so our old traditions from my family as a child, and my new traditions for my own family will continue. We will keep traditions that can be passed down from generation to generation. Perhaps not always in the exact way they have been held in years past, perhaps now with a twist on a name or a recipe but the traditions will stay alive in their warmth and meaning just the same. Love the story and the recipe and ohmyheart, yes, tradition warms me over – twice. Lovely post. We had a tradition in my family. Sadly, it stopped when my grandfather passed and the younger generations spread across the country. For every holiday we played music. Me on clarinet, sax or guitar – my grandfather on sax or trumpet – my brother on trumpet – and either my aunt or cousin on piano. Those of us without an instrument jammed in our mouths would sing or bang pots for a beat. It was tons of fun! Looking at your pictures Shannon, I can see that your baking sheets get a lot of love – well used baking gear is the best. Also, have you tried fully organic vanilla extract? I think that the McCormic stuff is junk. Also also, try making your own. My wife does. It’s not cheap, but it is easy to do and tastes better than anything you can buy. Eric, that sounds like such a fun tradition. I am sorry it stopped with your grandfather, maybe you can bring it back? Pots and spoons for all! Yes, my gear is well used and somehow it does make it better. I will try the organic vanilla, I am curious to see the difference in taste. Thanks for the tip. I will think about making it too, but it may be awhile, so for now I will give store bought organic a shot! 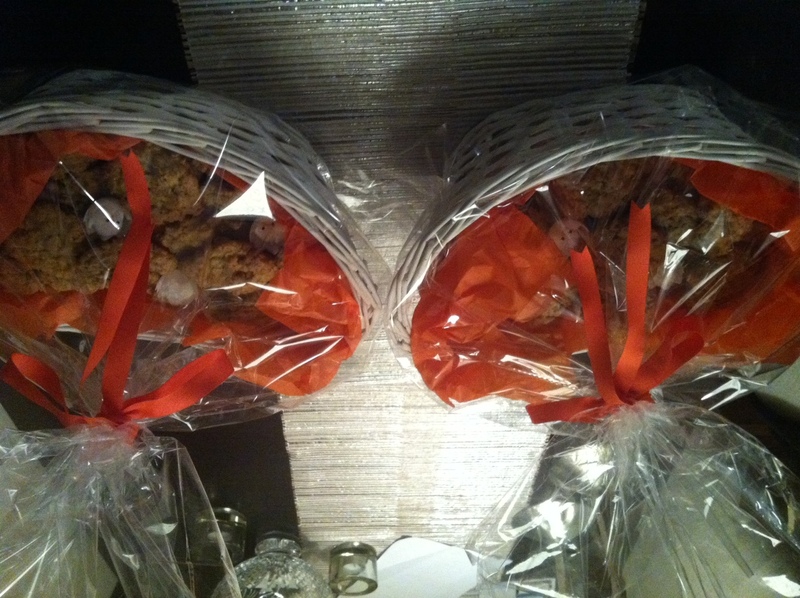 :) cookies are on their way! lovely. the sentiment and the cookies look divine! Thanks lovely lady! Have a great weekend! Thank you! This was the last picture of my grandma taken on her birthday. She passed 11 days later. She seems to be radiant in this photo, I love It. Yes he was quite helpful:). What a lovely tradition to continue – and those cookies look amazing! I can actually smell them through the screen they look so yummy. Thank you! I am sending you them through the screen! Beautiful story and now I want to try your recipe, thanks for sharing. Thanks Jessica! It’s really yummy and the feedback is always amazing. I hope your family enjoys them as much as ours does!